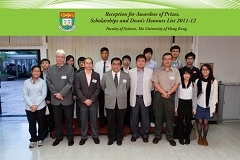 Yeung Ho-tin is also one of the frequent scholarship-recipients in Po Leung Kuk Laws Foundation College. Although Timothy has always been interested in Mathematics and Science-related subjects, those scholarships he has received have acted as incentives and catalysts which motivate him to further strive for excellence. Upon the receipt of the scholarships (HK$20,000 from PLKLFC and HK$100,000 from HKU), Timothy indicates that he would not disappoint his teachers and those who care about him. Like other scholarship holders, Timothy would like to contribute his scientific knowledge to society as he feels he has been receiving a lot from others and it’s time to give back.